Among the priority tasks of Roscosmos is cooperation with other countries related to study and use of space. Roscosmos develops bilateral and multilateral international political, economic, science and technical as well as legal collaboration. The Agency is internationally involved in fundamental space studies, satellite observations, global satellite navigation systems, earth remote sensing, use of space operating results and so on. Roscosmos keeps on cooperating with its partners in terms of space exploration despite the challenging geopolitical environment. Russian space industry reform has not and will not influence obligations being fulfilled by Russia concerning international space cooperation including such of International Space Station (ISS) program and delivery of rocket engines to the USA. Russia has concluded peaceful space study and use agreements with such countries as the USA, European states, China, India, Brazil, RSA and others as well as European and US space agencies (ESA and NASA) and other bodies. Among the priority focus areas is carrying of foreign spacecraft by Russian launch vehicles with joint enterprises also involved for international marketing purposes. In this regard Russia has an obvious priority by making the major part of international commercial space launches. It goes without saying that International Space Station Program is the current biggest international space project being implemented by Russia, the USA, European Space Agency members, Japan and Canada. Thus far the station cannot be reached without our launch vehicles since Russia is the only state to have spacecraft capable of delivering cosmonauts and astronauts into orbit. Last year it was agreed in principle to extend ISS operation till 2024, to develop station-based scientific and technical experimental procedures and make their outcomes available for all 15 ISS member states. It is going to ensure making many scientific experiments, the outcome of which will be further possibly used during training for long-term flights, to the Moon or Mars, for example. The works over Center Spatial Guyanais-based Russian and European ‘Soyuz’ project are still under way now. The improved medium capacity vehicle ‘Soyuz-ST’ was launched for the first time from Kourou Space Center in October 2011. As of September 2015 12 such vehicles have been successfully launched from this center. The very important area of Roscosmos international activity is Russian GLONASS positioning system-related cooperation with a number of foreign partners. To accomplish tasks assigned Roscosmos along with other involved government authorities is engaged in developing and approving draft agreements with other countries with regard to various areas of space activity as well as implementing projects involving international bodies and associations (APEC, ASEAN, BRICS). Roscosmos is fully engaged in the activities of UN Committee on Peaceful Uses of Outer Space (UNCOPUOUS), its scientific and technical and legal subcommittees, Inter Agencies Space Debris Coordination Committee (IADS), Committee on Space Research (COSPAR), Space Agency Forum, Committee on Earth Observation Satellites (CEOS), International Astronautical Congress (IAC), International Charter on Space and Major Disasters as well as other bodies. The current situation is that manned cosmonautics and outer space research may be performed on the basis of extended international cooperation. Russia cannot be avoided in such projects. Quite recently, at the end of January, European Space Agency, NASA and Roscosmos discussed the opportunities of would-be International Lunar Station. Currently international expert group is working on defining how international space cooperation is to be implemented after ISS shutdown. Russia has fully carried out its international obligations. 6 foreign spacecraft were launched, 4 space transports and 4 manned spacecraft under ISS-related program were successfully launched too. In 2015 Roscosmos trained four ISS crews. 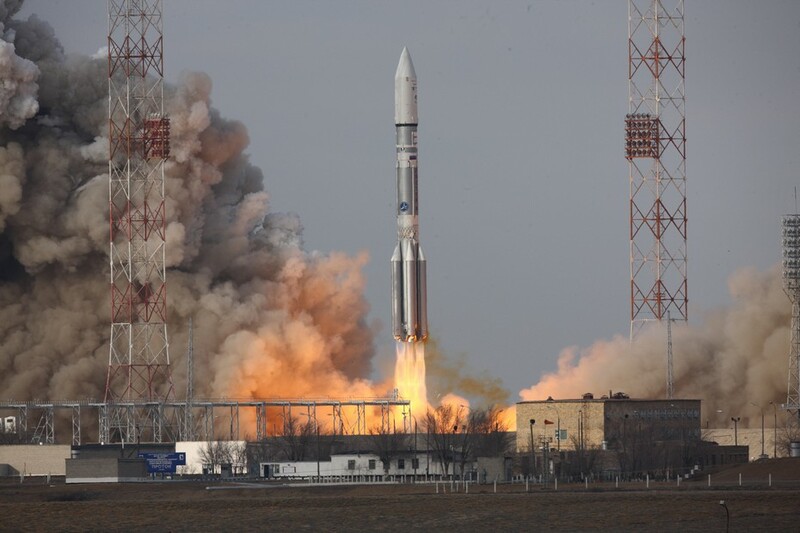 Khrunichev Space Center subsidiary company International Launch Services and Intelsat, the leading world satellite service provider have undersigned a contract for ‘Proton-M’ to be launched five times from Baikonur space center till 2023. NPO Energomash Scientific and Production Association named after academician Glushko and and US RD Amross company have concluded an additional agreement to deliver rocket engines. Up to and including 2019 NPO Energomash is to deliver to the USA 20 more RD-180 engines to be used as part of first stage launcher of Atlas V vehicle. Roscosmos director general Igor Komarov has held negotiations with director general of French National Center for Space Studies (CNES) Jean-Yves Le Gall. They discussed conditions and opportunities of the bilateral space cooperation including Center Spatial Guyanais-based ‘Soyuz-ST’ program implementation. We agreed that French experts would be fully engaged in a number of Russian promising scientific and applied programs. Following the negotiations a long-term cooperation declaration of intentions has been signed with regard to space studies. An important event is to be a celebration of 50th anniversary of Russian and French space-related cooperation to be held in 2016. In September negotiations with the head of Italian Space Agency (ASI) Roberto Battiston were held with regard to development of cooperation related to manned cosmonautics, use of ISS and improvement of European launch vehicle ‘Vega’. The same September there was a meeting with Brazilian Space Agency authorities. The parties intend to develop cooperation in navigation and Earth remote sensing, Brasilia-based land GLONASS stations and perform joint monitoring of space debris. Brasilia has taken a favorable view of our two land GLONASS stations and expressed its interest in increasing their number. The head of Roscosmos met Ambassador Extraordinary and Plenipotentiary of Republic of Korea, Pak Ro Bek in November. They discussed practical issues of cooperation in creating methane engines, space electronic components and launch facility for new vehicles. There was a declaration of compatibility and complementarity of GLONASS system and Chinese navigation system BeiDou as well as Memorandum on Cooperation in exchange of data of Earth remote sensing agreed with and signed by China National Space Administration (CNSA). The preparation of ExoMars-2016 expedition has come to its completion stage. This mission has to be the second largest after Russian and European project involving Kourou-based ‘Soyuz-ST’ vehicles launches. In the end of December 2015 ExoMars-2016 scientific units, i.e. orbital and demonstration landing modules Schiaparelli were delivered with ‘Volga-Dnepr’ An-124 aircraft to Baikonur Space Center. ‘Proton-M’ vehicle is due to be launched in the period from 14 to 25th of March, 2016. The unit will be launched by means of ‘Briz-M’ upper stage-equipped vehicle. Orbital platform and demonstration module are made by EKA. The orbital module with scientific instruments half of which has been produced by Russia will be engaged in studying trace gases in the atmosphere and water ice distribution in Mars soil.